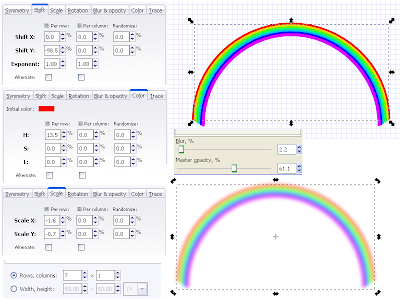 Illustrating rainbow with Tiled clones tool in Inkscape. Illustrating Rainbow with Clone tool in Inkscape. After some gap, I'm back again. This post is about drawing a rainbow. There are actually two ways you can do it. One is by creating a rainbow color gradient and fill a semi-circle with it. The other is by using the tiled clones tool. Tiled clones happens to be one of the most powerful & interesting tool in Inkscape and here I am trying to draw a rainbow with it..
To start with, select the Spirals tool (F9 key) and draw a semicircle. 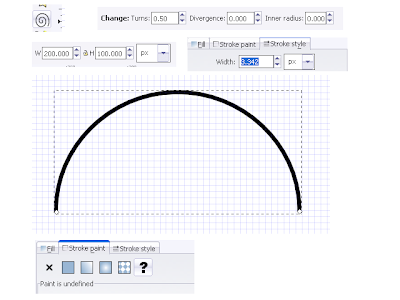 Adjust the width, height and stroke width as in the image. Now select the stroke color as the one with '?' (question mark :paint is undefined) in the stroke paint tab of fill and stroke menu. We need to do this because for changing colors of clones using clone tool it is necessary that the paint is undefined for the object. Now,the arc/semi-circle will be invisible. Next is the cloning step. Scale: scale X per row is -1.6, scale Y per row is -0.7, all others are zero. Color: Initial color be red, for per row field change the H value to 13.5. Rest all should be 0. We wont be using rotation blur & opacity so we can leave them as they are. Now press create, your rainbow is ready. Give it a little blur and decrease its opacity. You have your Rainbow. You can add a few clouds like the ones here. Apply a little blur to these clouds and it will look a bit realistic.